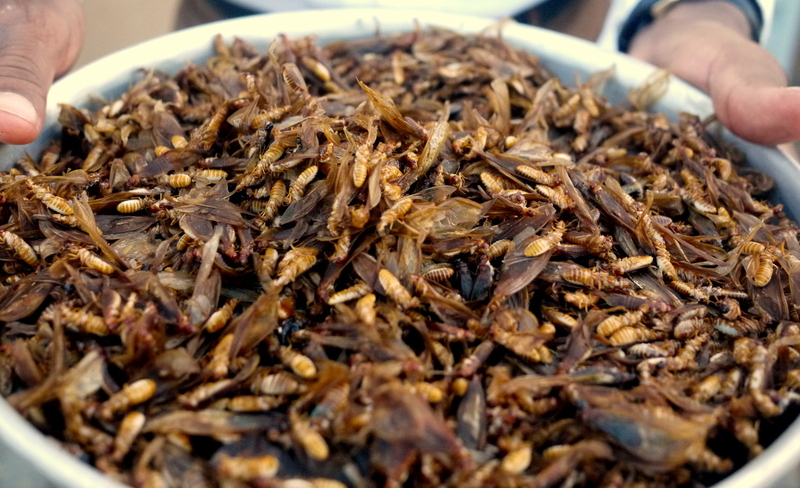 Who Wants to Eat Some Bugs? The only part that takes a little technique is the wing removal. Check out the fourth and fifth photos in this series as my colleague Bazier demonstrates the two step “shake and blow” technique. By tossing the bugs up and down, the already somewhat crispy wings will naturally fall off. Then just blow gently while shaking (if you look closely at the fifth photo you should be able to see some wings coming off). We also tried a few different seasonings, including my precious american parmesan cheese and crushed red pepper, but just salt seemed to be the winner. I actually have always been interested in eating bugs and this sounds kind of good. I never got around to eating cicadas when they were in season and abundant a few years ago, but next chance I get to eat bugs, I probably will. Thanks for the photos too! Yum. Those things! We totally got attacked by a swarm of those things last night. I thought it was some sort of biblical plague so I hid under my bed, but in retrospect I wish I knew they were edible. If they attack again, I’ll be sure to prepare a gourmet Worthington-grade meal. I know! They definitely swarm like locusts and a few made it into my house as well (when I opened the door quickly). So many came that by the time we had swept up a handful, another 100 or so had already come. We probably collected them for about 20 minutes, and only stopped because we had plenty already.